As a major actor in the jewelry industry, our group needed to strengthen its CAD/CAM department as much for machine driving as for creation. Off course, everything cannot be done exclusively by hand because of financial as well as material and human constraints. TYPE EDIT has really helped us save a lot of time during the creation and machining processes. It has also helped our designers improve their creation diversity. TYPE EDIT has become an integrated part of our daily job and increased our efficiency considerably. TYPE EDIT is mainly used for graphic creations, die stamping, cast-ironed tools, etc. It is also used by permanent designers who work exclusively for Groupe GL at the creation department. The ergonomy of the software’s interface was the first element that impressed the staff. A screen for each and every step of the creation is a practical and precious tool. 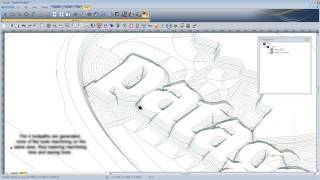 The power of the TYPEART 3D module, as well as the CAM module’s capabilities, reinforced this initial impression. LASERTYPE is the only one to guide the user from A to Z, from the creation process all the way to the final object, and guarantees contextual help at each step of the way. The Favorites toolbar eases the work process and speeds up creation time.